Bild Architecture recently developed and submitted a design concept as a response to the Bayside Adapts Design Challenge. The purpose of the challenge was to propose creative approaches for addressing sea level rise in the Bayside neighborhood of Portland, Maine. Submission requirements included the establishment of a climate change scenario stating the time frame and projected sea level rise as a benchmark for the design, a clear description of the design concept, and supporting graphics. Bild’s climate change scenario projected a 6 foot rise by 2100, with a deadline of 2060 for installing the proposed infrastructure. The design concept focused around the addition of a canal that would be utilized to drain the neighborhood from frequent flooding. The plan also proposed for I-295 to be decommissioned as a highway and to be converted to a multi-model avenue at the same elevation. The converted road would be used as a levee against future sea-level rise and would allow the new urban road to be the future commercial waterfront of Portland. As sea-level rises beyond the design scenario, the City would have the option to allow water to rise in Back Cove or to construct flood gates at the location of Tukey’s Bridge, making Back Cove a protected harbor. Recreational uses and property value were the center of thinking on this plan. The canal, would create a draw for a new pedestrian element in the city and would spur the construction of buildings along the canal, as well as serve as a recreational “green belt” increasing pedestrian connectivity between Deering Oaks Park and the Eastern Promenade. 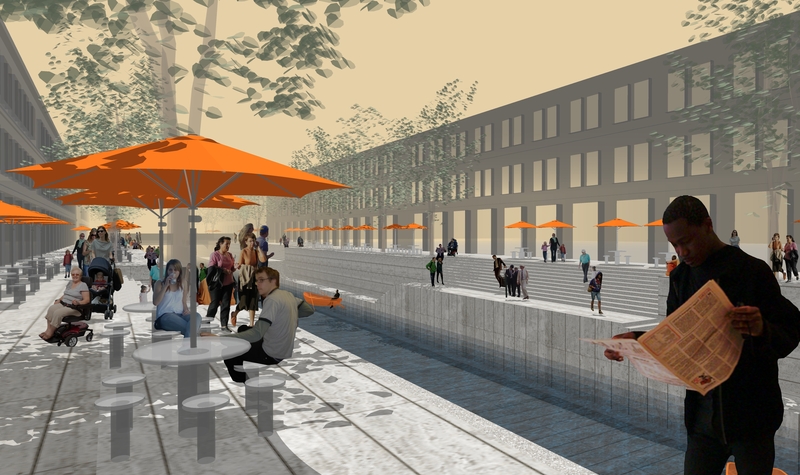 Teams who submitted design entries included mbla & Canal 5 Studio, Aceto Landscape Architects, Alyssa Phanitdasack, Bild Architecture, and Soren Deniord Design Studio & Kaplan Thomspon Architects. The submissions to the Design Challenge will be displayed for public viewing on May 3 at the Rines Auditorium in the Portland Public Library, and the winning submission will be awarded at 7:30 PM that evening. More information about the event may be found here. This entry was posted in educational, news. Bookmark the permalink.